then a Scaleup is “an organization formed to establish the foundation, skills and systems to create, deliver and harvest value in order to capture sufficient market share to influence the market”. Inferred from Steve Blank’s post above: A Scaleup is the transitional stage between Startup and Company. I get my best ideas when I’m talking them out, so you’re invite to participate in an open webinar series to explore seven main topics in this research project. The videos of each session will be posted here on scaleup.davender.com about 24 hours after each session. Explore the success criteria of scaling your venture, whether you are a startup entering the market for the first time, or an established business launching a new product or into a new market. Prior to 2011, startup founders had to discover what worked and what didn’t, mostly through trial and error. Then the research published by Max Marmer (Startup Genome), Eric Ries (Lean Startup), Steve Blank (Customer Discovery) and others provided a more evidence-based and systematic process to guide entrepreneurs from idea generation through validation and initial launch. These frameworks greatly increased the quality and success rate of entrepreneurs, while reducing risk and cost. However, most of these frameworks end at market entry, treating the rest of the process as a generic “scaleup” phase. In reality, scaleup is now the riskiest and most capital-intensive part of launching. My basic hypothesis is that there is a “scaleup framework” with distinct phases, priorities and success criteria, which can be used by entrepreneurs, investors and ecosystem managers to reduce the risk of scaling up while improving the success rate. This series of seven webinars will explore various parts of the model. You are encouraged to provide your comments and feedback. Register to get an e-mail with the connection instructions, links to the recordings and other information. This study is based on my local experience, based on Canada and more specifically Montreal and Quebec. Each ecosystem has its own startup physics. Bay Area startups (at least the ones I read about on Tech Crunch) can attract a $10M seed round, while here it’s more like $50k Cdn, or $100k if you’re plugged into the local accelerators like FounderFuel. Growth ambitions are also different if you’re from the Valley. I would say that easily half of the startups I read about on TC echo a similar idea pitched at a local Startup Weekend or Demo Day. The difference is the network. The scaleup physics also changes if one is B2C or B2B (or B2B2C). In the B2C case you’re trying to get lots of small LTV customers and the abandon rate is huge. In the B2B case, it’s more about getting a few customers (in the hundreds or thousands instead of the millions), with large LTV and hopefully lower turnover. In the case of B2C, the user is the payor, while in B2B, there is one payor for hundreds of users. This discussion and scaleup model will focus on B2B, software (SaaS) and hardware, and in the Montreal context. I hope that further extensions of this study can validate its applicability to B2C and also broaden the applicability. Although I doubt I will crack the code of Silicon Valley. I’m of the opinion that trying to do so will be counterproductive, because the scaleup physics of SV don’t apply in the real world. An interesting discussion the other day brought up the question “can a startup be ‘born global'”? We’re talking here’s about startups and not scaleups. The current model hypothesizes (sp?) that the chosen beachhead market is geographically local, or at least where the startup CEO has personal connections or is familiar/is known in the market. In this initial scaleup, the venture is not only expanding its client base, but is also maturing as it develops the foundation and systems to be able to serve this new client base. 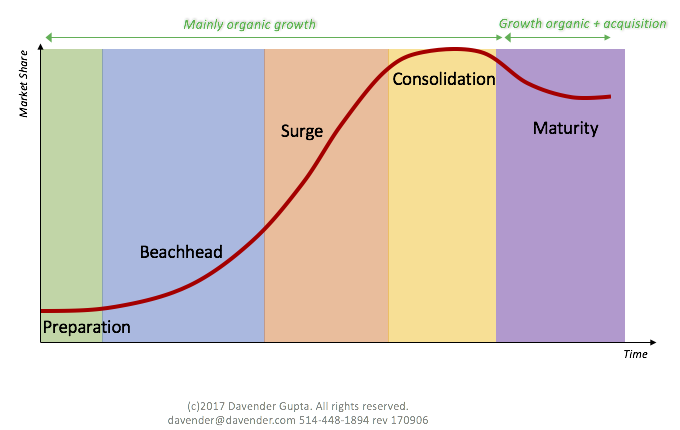 This expansion and maturing requires a significant amount of resources which the venture rarely has on hand at the start of the beachhead scaleup, so the chase after resources and capital adds a third dimension of stress on the venture. Also, the objective of a beachhead scaleup is to become the leader of the beachhead market, or at least control a sufficient part of the beachhead market that it is seen as a new leader, and this needs to be done within 12-18 months. The beachhead market is defined as relatively focused. Assuming that revenue at the start of the beachhead is only $100K-500K ARR, and at the consolidation stage should be about 10x (i.e. $1M-$5M). So the beachhead market will probably not be big enough to be global. The economics of servicing a $5M market (B2B) effectively are just not there. A. The first scaleup bump, or beachhead, established the startup as a serious player in a “local” beachhead market and positions for a Series A. B. The second scaleup builds on the first for a second 10x jump to $10M-$25M+ at which point it is global. During the first scaleup bump, the venture is growing customer base, maturity and resources/capital base at the same time. During the second scaleup bump, the venture has enough execution maturity and capital to focus more on growing the customer base. (As always all of this is hypothesis at the moment, and is scaled to Canadian and Quebec realities and expectations). I’ve compiled a list of current Scaleup Lifecycle Models that I have found so far. The term “startup” is used in various ways, and now is generally understood to refer to a technology-based company which aims to grow fast, disrupt current markets, and be funded by venture capital. The lessons learned of the first wave of late 1990s startups was mainly recorded in blog posts and informal papers. In 2010, people such as Alexander Osterwalder, Ash Maurya, Eric Ries and Steve Blank started to publish books which gathered and structured this knowledge. Their work led to the Lean Startup and Customer Discovery methodologies which systematized how startups should approach the early stages of formation. A specific finding from Marmer’s survey is that there are specific business model hypothesis which need to be validated before a startup moves into scaling mode, otherwise the startup fails – a phenomenon he called “Premature Scaling”. This was a revolutionary finding which has now become the basis of high-end acceleration programs. What I find interesting from many of these frameworks is that they focus on the idea creation and validation stages, but then lump everything after initial go-to-market in a generic “Scaleup” step. Marmer was explicit about excluding the scaling stage from his model, probably intending to extend his work later. Unfortunately, he never got around to it. The main benefit of the startup frameworks is that they greatly lowered the risk and also the cost of the early phases of a startup. I believe that the systemization and standardization based on the two basic steps of seeking problem-solution fit and product-market fit have contributed to the proliferation of the startup support ecosystem. It is time to do the same for the scaleup phase of high-performance entrepreneurship. By segmenting the “beyond there be dragons” world of scaleup into discernable phases with essential go-no go decision criteria, I am convinced we can better manage the risk of scaleup and improve its survival rate. The chart is Time on the x-axis and Market Share on the y-axis. Growth is something all businesses need to do. Scaling is a focused, timebound project to significantly increase market share with the objective of also increasing revenues. Scaling is growth, but growth does not necessarily mean scaling. Scaling also implies a transformation of the organization.